If you would like to vacation in Europe but can't quite make it over, this might be a wonderful alternative. 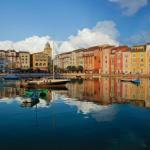 The Portofino Bay hotel is more than a resort, it is like entering an Italian riverside village. You can even get to most locations within this charming Italian style complex by complimentary water taxis and shuttles. And did I mention that Universal Studios is only a stone's throw away. And that Universal City Walk, with its eclectic restaurants and clubs is within a few short miles? It doesn't get better than this. The accommodations in this resort are clean and fairly spacious and the beds are quite comfortable. With 750 rooms and 45 suites many people even choose to have their wedding here, as they can accommodate parties both large and small. If you love to be pampered but your honey loves the golf course, you can relax with some of their world famous spa services while he practices his swing at some of the most amazing golf courses in the world. And if you have children, they will be well entertained in the Campo Portofino activity center. Love the parks? Enjoy express pass access at the Universal Studios theme park. Boredom does not exist at the Portofino Bay Hotel. Parking: Yes, there is parking. Both valet and regular parking are available. Pets: Yes, pets are allowed. A cleaning fee of $25 will be charged per room but no size restrictions are imposed.